Remember the Virtual iPhone? Well, it's been updated. 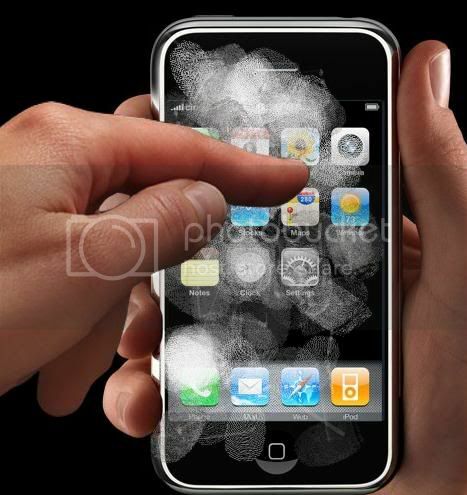 Now it not only smudges, it scratches! I was going to get one but Rogers Wireless dropped the bucket/screwed the pooch/slept on the job/landed with their gear up... oh hell just look at the following link, our national news equivalent to CNN! I'll wait until I can order one from France and then use it since their all unlocked and I won't have to pay 50 cents a Meg. So, to punish Rogers, Apple... gives them exclusive sales rights? Apple should have pulled Roger's phones, not their own. Or simply mandated a better contract. All they're accomplishing is creating an artificial shortage which will cause an even higher demand. it would seem that Apple didnt know what Rogers was planning to do as far as programs. the contracts were signed long ago and apple cannot just back out on them. Apple should have dotted their P's & Q's to mix a few metaphors. Rogers has a bastige of a contract and Apple allowed it to happen under their nose with no oversight. The losers in the deal? Canadian shoppers. Apple doesn't have the clout in foreign markets that they have in the US. For everyone else, it's just another phone to market. Yep...groups like the EU don't let you hold as much sway over your customers as we allow here in the US. Canada is much the same as Europe in that regard. Hope when Friday comes those 50,000+ petitioners don't buy the iphone under rogers and they enjoy an epic failure of epic proportions. Spidey senses tell me they'll sell out all iPhones everywhere.